History into a bit of a fine line?! ancient dynosaur religion publicly funded by government, serving their own biased teachings...! While more than 630 Ontarians to date have legally ended their lives with the help of a nurse or doctor, none have been able to do so within the walls of a hospital that has historic ties to the Catholic Church. But advocates for medically assisted dying argue that since these are public-funded health-care centres, they are bound to offer the option — even though Ontario law currently exempts any person or institution that objects. It's legislation that Dying With Dignity Canada may challenge in court, according to the group's CEO. 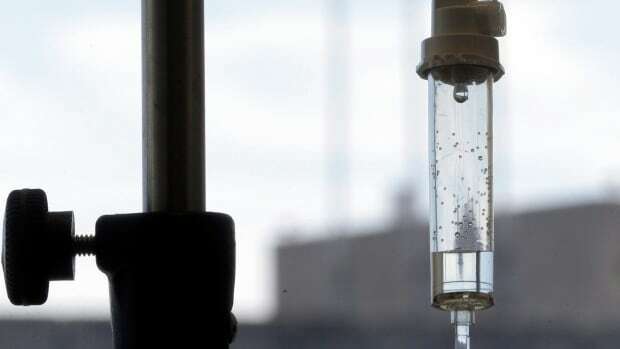 "What Ontario did is they gave an opt-out to basic and essential health care to hospitals that don't want to provide for the dying," says chief executive Shanaaz Gokool. Instead, the law states that the hospitals, hospices and long-term care centres unwilling to perform medically assisted death must transfer a patient to a facility that will. They must do the same in cases of abortion, which is also forbidden by the ethical guidelines set out by the Catholic Health Alliance of Canada. EVE was not a "weaker" vessel, she was "more innocent" and so had no real understanding of wrong and good, thus did not understand really what is was to disobey! But she was not "dumb"...! ...to the more than one versions of the Tree of Life of Eden and the weak Woman for which we all suffer this Worlds childish Religion...from "irresponsibility of innocence" to a "reason for EVIL"! Lost a few glasses, some on both sides, so far to very bad lasting radiation or other! GOING NOW FOR DIRECT EYE SMEARS...! DANGER - green eyes...! STATE OF WORLD AND USA affairs! anagrammatt/anagrammatter finally for today 25th july! on the 24th was the celebration of the Venezuelan/Colombian birth date of Simon Bolivar - that was not accepted as a only Dictator, but he leading liberated them - what has become worse?! STATE OF WORLD AND USA affairs! anagrammatt/anagrammatter finally for today 25th july! on the 24th was the celebration of the Venezuelan/Colombian birth date of Simon Bolivar - that was not accepted as a only Dictator, but he leading liberated them - what has become worse: a Monarchy or a failed Democracy?! Thursday, July 20, 2017 Solar Eclipse USA 21 Aug 2017...! Thursday, July 20, 2017Solar Eclipse USA 21 Aug 2017...! Solar Eclipse USA 21 Aug 2017...! certain coincidences, and rotations of planets and moons! ..has the World, Science and the Bible with Jesus been eclipsed totally by my Book: Book of Pure Logic? Nearly! Scientists believe the iceberg -- likely to be named A68 -- has a volume twice that of Lake Erie in North America and is more than three times the size of the greater London area. This BLOG has just OPENED room: as NOAH's one and only one ARK ! So we have come to ANAGRAMMATT 4 from anagrammatt 3 - This World has a maximum carrying capacity also! This BLOG has just OPENED room: as NOAH's one and only one ARK ! So we have come to ANAGRAMMATT 4 - This World has a maximum carrying capacity also! Qudos to the animal lovers and the God of the Bible! This BLOG has just OPENED: as NOAH's one and only one ARK ! So we have come to ANAGRAMMATT 4 from anagrammatt 3 - This World has a maximum carrying capacity also! HOW MANY PEOPLE CAN OUR WORLD SUPPORT? No species has altered the Earth’s natural landscape the way humans have. Our impact is so extensive that we are crossing into a new geologic epoch – the Anthropocene – propelled by human behavior. Global climate change, mass extinction, and overexploitation of our global commons are all examples of the ways in which humans have altered the natural landscape. Our growing population, coupled with rising affluence and per capita impact, is driving our planet closer to its tipping point. With population expected to reach 9.5 billion by 2050, many wonder if our natural resources can keep up with our growing demands. The World Population Map can be viewed with the data overlay, “Anthropogenic Transformation,” created by ecologist Erle Ellis. Instead of dividing the world into classical biomes (savanna, rainforest, woodlands, tundra, etc. ), Ellis conceived of depicting a map of “anthromes” to describe the way human have reshaped the earth’s ecological patterns. The Anthrome map shows croplands, rangelands, urban areas and other human settlements. Human population, now over 7 billion, cannot continue to grow indefinitely. There are limits to the life-sustaining resources earth can provide us. In other words, there is a carrying capacity for human life on our planet. Carrying capacity is the maximum number of a species an environment can support indefinitely. Every species has a carrying capacity, even humans. However, it is very difficult for ecologists to calculate human carrying capacity. Humans are a complex species. We do not reproduce, consume resources, and interact with our living environment uniformly. Carrying capacity estimates involve making predictions about future trends in demography, resource availability, technological advances and economic development. One way to address the challenges associated with making future projections is to look at current human impact on the planet. The ecological footprint is a measurement of the anthropogenic impact on earth. It tracks how much biocapacity (biological capacity) there is and how much biocapacity people use by comparing the rate at which we consume natural resources and generate waste to the planet’s ability to replenish those resources and absorb waste. Today, our global footprint is in overshoot. It would take 1.5 Earths to sustain our current population. If current trends continue, we will reach 3 Earths by the year 2050. Our planet does not have the biocapacity to sustain our current levels of growth and resource consumption. So, what can be done to minimize our collective impact on the environment? In his book, How Many People Can the Earth Support?, mathematical biologist Joel Cohen classifies current solutions into three paradigms: those looking for a “bigger pie” (improving technology), those advocating for “fewer forks” (slowing population growth), and those looking to rationalize and improve decision-making though “better manners” (changing global culture). Cohen argues that, standing along, each paradigm is necessary in solving our environmental crisis, but not sufficient. Change must come from a combination of all three. “Promoting access to contraceptives, developing economies, saving children, empowering women, educating men, and doing it all at once,” he writes, is a way to both lower our impact on the planet and improve the quality of life for all. Perhaps Oxford economist Robert Cassen said it best, “Virtually everything that needs doing from a population perspective needs doing anyway”. Adopting human-centered initiatives targeted at addressing both population growth and consumption habits, ranging from the individual to trans-national level, are our best hope for achieving a sustainable future. no worries crude oil will do the big melt...! Higher seas to flood dozens of US cities, study says; is yours one of them? we are in good dutch hands, Holland and the Netherlands...! Copyright ©2017 - Sharing attribution rights - Social media rights and creative commons rights. Simple theme. Theme images by konradlew. Powered by Blogger.